This is more of a truck stop than anything else. If you want a fairly quiet place to relax and are sensitive to noise, this is not the place for you. Trucks coming in at all hours of the night, running motors/generators and generally making a lot of noise. One of the nicest casino's we have ever seen and a very good buffet. We stopped at the Ameristar in Kansas City on our way back across country. The current reports are all accurate and I'm sending a photo of the parking lot. This casino was a pleasant surprise. Very roomy and well ventilated, not what we're used to finding with riverboat casinos. The websites call it a stationary riverboat but in reality it's completely land based. The décor is a little bit Vegas with lots of stained glass, arched sky ceilings and a bricked street shopping and dining area. All of the restaurants are located together so you don't have to traipse through the casino searching for food. We enjoyed it enough that we would have stayed another day if we'd had the time. The fact that we left $400.00 dollars richer may have figured into that though. 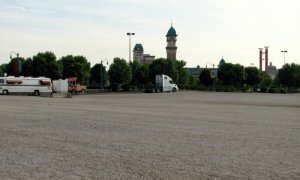 This casino parking lot has easy access to the expressway and plenty of parking for even the largest of rigs. No specific RV parking, just a lot for big rigs. It seems to be popular with the truckers as there were about 25 in the parking lot. This did not limit the RV parking at all for our 40 ft motorhome as the lot is plenty large. As mentioned there is no shuttle, but in good weather there is no need. The front door of the casino is only a short (5 minute) walk from the RV parking. Security gave us the thumbs up for staying the night and they drove through the lot several times that we saw. The casino has several restaurants that cover all of the culinary bases and prices. The buffet is good quality but a bit expensive at $23. Although we live in the area, we have overnight parked at Ameristar on several occasions. We don't like to drive freeways at night so when we have some special program to attend -- drawing, shows, fireworks, etc. -- we take our motorhome and spend the night. Ameristar has acres of parking lots plus a 4-story parking garage so plenty of parking space. They ask campers and trucks to park in one lot near the front entrance. You can't miss it, there are always semi trucks parked there and usually some campers. It is a pretty good hike to the casino and no shuttle service is provided. The lot is large enough campers can usually get away from the noise of the trucks. Our motorhome is small so we normally park in a regular car parking lot closer to the casino then move to the big lot for overnight parking. Sometimes we have a note on our windshield when we come out of the casino telling us where we should park but nothing more serious (or threatening).